Ricoh has replaced its Ricoh Caplio GX8 with the new Ricoh Caplio GX100, a digicam that isn't quite a compact, or a digital SLR. With a 10-megapixel, 1/1.75-inch CCD sensor, the Ricoh Caplio GX100 has a 3x wide optical zoom lens with an optional 19mm conversion lens for even wider shots. The 2.5-inch LCD screen at the back offers a 170-degree viewing angle. 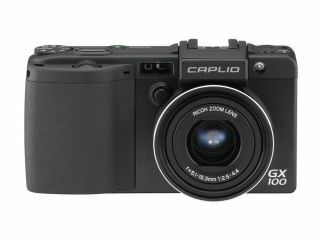 The compact, 25mm thick Caplio GX100 includes the built-in Smooth Imaging Engine II which ensures better pictures, in combination with vibration correction software. It has a removable electronic viewfinder that allows users to take photos in a more traditional manner. The Ricoh Caplio GX100 will go on sale at the end of April for £400.